Victoria, British Columbia, is one of my favorite places to visit. On my second trip there I overheard two women talking about their grown children coming home to visit and other things going on around their town. I thought it would be fun to write a novel about a man who grew up in this beautiful town and the tourist he fell in love with. I researched the settlement and history of Victoria and decided that the male lead would be part Scottish and part First Nations Esquimalt Family. Thus, the handsome Craig Hameston, stepped from my imagination onto the Victoria Clipper and met Kathryn Sinter, a soon to be divorced woman who recently moved to Seattle. Their love story is intertwined with forgiveness and redemption, recurring themes in several of my romance novels. Kathryn settled into her seat near the exit on the Victoria Clipper. On the seat beside her she arranged her handbag and small tote packed with her electronic toys. For several minutes she watched passengers streaming by, looking for their own cozy spot for the crossing to Victoria. She was hoping no one would take the seat across from her. A woman with a cute little girl hesitated and then continued down the aisle. Kathryn breathed a sigh of relief and brought out her iPad to resume her book. She returned to her screen, trying to ignore the man as he settled into the seat across their shared table. He was wearing a short sleeved navy shirt and khaki pants. She could not help but notice his broad shoulders and well-muscled tanned arms as he set his worn black brief case just to the left of his feet. He had light brown closely cropped hair that had a sprinkling of white. Kathryn looked out the window when the ferry’s horn signaled the captain’s intent. The Clipper slipped smoothly away from the dock into the harbor. For several minutes she continued gazing out the window as the ferry churned farther away from Seattle. When she turned back, the man greeted her with an engaging smile. Not flirty, just genuinely friendly. “Is this your first trip to Victoria?” he asked. His voice was deep and almost melodic. “Are you just visiting in Seattle?” he asked. Kathryn squirmed, reluctant to let the conversation go into more personal territory, but she said, “I just moved there. I’m not even unpacked. Not really.” She squirmed again, unsure why she had given him more information than a stranger would want to know. Silly of her to do that. Kathryn gave him a suspicious look and then nodded her reply. A crew member appeared. “What can I get for you Mr. Hameston?” he asked. They both took a sip. He was right. The wine was not very good. 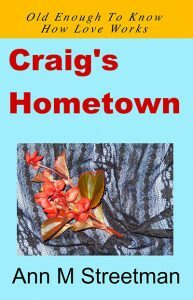 Craig said, “My own heritage is similar to quite a few folks in and around Victoria. I’m part First Nations Esquimalt Family and part Scottish.” He took another sip of wine. Kathryn said, “That’s a beautiful story.” She took another sip of her wine, looking away from this unusual, interesting man. Craig frowned and leaned back against his seat, looking intently at Kathryn. She looked out the window and then turned back toward him. “Bampot,” Kathryn repeated. “You’re right. He is a bampot, but that term may be too kind. I think of him in harsher terms on most days.” She held Craig’s eyes, trying to discern his reaction. He nodded his head and took another sip of wine. Kathryn looked out the window and back at Craig. “What was your job in the Reserve?” Kathryn asked. Craig smiled at the blush rising on her cheeks, but didn’t acknowledge it. “Maybe. Maybe not. I don’t really know. I’m just determined to make a fresh start. Maybe new volunteer work, new friends,” she said. Kathryn watched him walking away. He might be retired from the Royal Canadian Navy Reserve, but he didn’t look like an old man. Not even close. Navy diver. Seaplane pilot. Wow. She never imagined she would meet someone like that on this little trip. But of course, she didn’t want to get involved. Just have dinner. That’s what friends do. She leaned against the window, hoping to get a glimpse of him getting off. Sure enough, she saw him go down the gangplank and into the terminal. After several minutes the luggage was offloaded in big containers and hauled into the passenger receiving area. She assumed she would have to claim her bag and pass through customs, probably not much to it since it was Canada. Finally, passengers with checked baggage were invited to disembark. She gathered her things and took her place in the line that snaked around the ferry and onto the gangplank. Claiming her bag and passing through customs was as easy as she had guessed. She stepped out onto the Clipper parking lot and saw Craig waiting for her. He put her luggage into the trunk of his black BMW and walked around to the passenger door. He unlocked it and held it open for her. “Thank you.” She smiled to herself, trying to remember the last time anyone had held a car door for her. Craig appeared to be an old-school kind of gentleman. Maybe it was part of his military tradition. Kathryn admired the car’s classy interior. It probably wasn’t a new car, but it was spotless. He started the engine and drove out of the terminal lot. He wheeled into the circular drive of the inn and parked just beyond the front entrance. He opened the car door for Kathryn and retrieved her luggage. “Can we help you with your luggage?” he asked. “No thanks. I’ve got it.” She turned and walked through the lobby past the opening to an inviting restaurant with indoor and terrace seating. A very pleasant-looking place. Perhaps she would have breakfast there. Kathryn opened the door of her room, dropped the handle of her rolling bag and threw her tote and handbag onto the bed. She kicked off her shoes. Drawing the drapes back, she opened the door onto a tiny balcony just big enough for her to stand on. She stepped out to enjoy the view. The bay sparkled in the late afternoon sun. She watched couples strolling along a sidewalk just out of ear shot. Too bad she didn’t have time for a walk. A few minutes later she stepped out of the shower, feeling refreshed and upbeat. She towel dried her hair and vigorously rubbed the fog-covered bathroom mirror to clear a spot. A hot blast quickly dried her long curly gray-streaked black hair. She leaned close to the mirror, examining the gray streaks, hating that they were coming in faster now. She was determined not to color it, but would need a trim soon. She had to find a hairdresser in Seattle pronto. She fussed with her bangs, wishing they would behave. Then she pulled the curls back and pinned them into a low cascade falling to the nape of her neck. Since she left Blake, she had let her hair grow, enjoying the long style he had said she was too old to wear. Craig was right. Blake Sinter was a damn bampot. She smiled at the thought. When she had finished her makeup, she took a closer look. Not too bad for a girl just turned 50. She zipped up her slim black travel pants and pulled on a favorite long sleeve blue tee shirt that matched her eyes. She checked her slim figure in the floor length mirror on the wall by the desk and slipped into a medium weight black wind breaker with blue trim. Surely it would be warm enough. She checked her image once more, picked up her handbag, and closed the door behind her.